Yoga sangamam organised by Vivekananda Kendra Vedic Vision Foundation as a preamble to International Yoga Day celebrations. As scheduled the Program started at sharp 6 am under the presidentship of Man Lakshmi Didi. 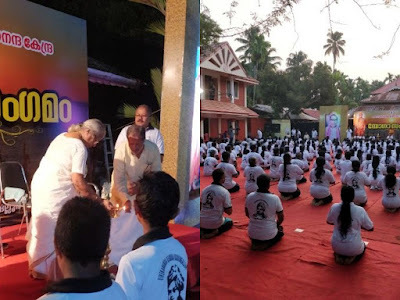 The Chief Guest of the programme was Yogacharya Sri Narayanji from Perumbavoor. Maj Gen. Dr. Vivekanandanji was also present to give his blessings. The programme started with invocation followed by presidential address by Lakshmi Didi. In her address she highlighted the significance of yoga in day today life. Yogacharya Narayanji spoke on the need to practice 'Tapas' and swadhyaya which are very essential for on to attain the spiritual benefits of Yoga. He made an appeal to all who were present at the function to do swadhyaya to reap the rich benefits of Yogic practices. Samuhika surya namaskar programme came next and the baton was changed to the hands of Sri Joshi who handled it with ease in guiding the participants to smooth performance of Suryanamaskar. Sri Premnath, the Chief Coordinator gave the vote of Thanks. The programme concluded with sankalpa and shanti mantra. Two hundred and forty participants took part.